Prospera Centre in Chilliwack, BC is a 100,00 square foot, multi-purpose facility with two NHL-sized ice surfaces. Prospera Centre’s main rink has seating for about 5,000. Home to the Chilliwack Chiefs, Prospera Centre also hosts numerous community recreation programs, conferences and concerts. From Alice Cooper to Michael Flatley’s Lord of the Dance have performed at Prospera Centre and the facility hosts numerous conferences, exhibitions and events throughout the year. For more information about Prospera Centre please click here. Parking is NOT free at Prospera Centre for events, unless you have a handicap sign. You will find handicap parking near our wheelchair entrance on the North East corner. We have provided directions for additional parking. 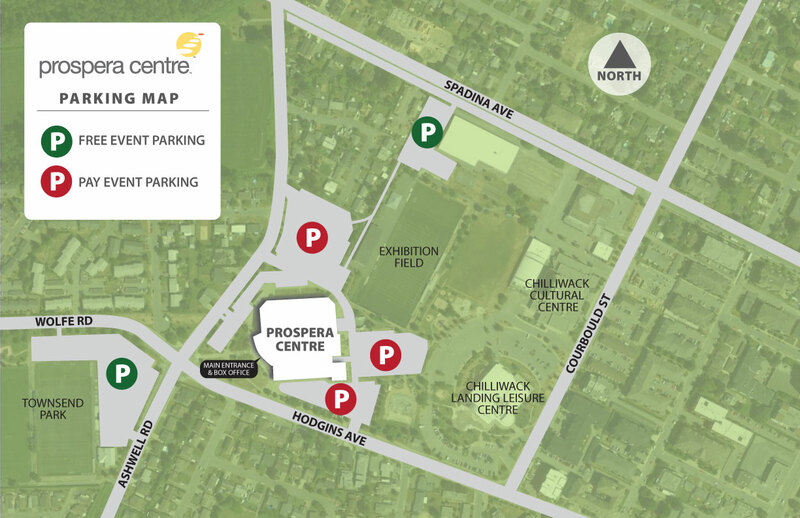 Townsend Park is located directly across from the front doors of Prospera Centre. On Highway #1, take Lickman Rd. Exit, stay left and turn onto the over-pass. Follow road until you get to Wolfe Rd. Turn Right on Wolfe follow Wolfe Road until you are near the four way stop. Parking at Townsend Park is located just prior to the four way stop on your right hand side. On Highway #1, take the Young Road exit (exit 120) turn right on to Young road. Follow road till you get to Hocking Avenue, and turn left. Proceed to Yale Road and turn right. Turn left on Hodgins Avenue, and follow road past the hospital, and through the traffic light. Continue on straight through the next set of lights, Townsend Park parking will be to your immediate left. Turn Right on Wolfe follow Wolfe Road through one set of lights, passing Prospera Centre which will be on your left hand side. At the next set of lights, turn left on Corbould street and follow till you get to Spadina Avenue. You will find 262 free parking stalls along Spadina avenue as well as an additional three lots on your left with a total of 231 free parking stalls. Turn left on Hodgins Avenue. Follow Hodgins until you find Corbould Street and turn right. On your immediate left you will find 237 free parking stalls. Continue on to the four way stop and turn left on to Spadina Avenue. You will find 262 free parking stalls along Spadina avenue as well as an additional three lots on your left with a total of 231 free parking stalls.